Boasting superior fuel economy for city and highway driving, the 2017 Honda HR-V is a sharp and stylish compact SUV with an array of standard amenities. The 2017 HR-V claims victory when compared to major competitors in the compact SUV marketplace, such as the 2017 Toyota RAV4. And despite boasting better fuel economy and features overall, the 2017 HR-V is still more affordable than the 2017 RAV4, with a base MSRP of $22,315* compared to $24,410. Discover the advantages of buying a 2017 Honda HR-V over models like the 2017 RAV4 by visiting our Honda dealership in Florence, AL, for a test-drive today! As you cruise along the Alabama countryside, you want your vehicle to work with you in terms of its gas consumption, which will consequently save you dollars at the pump. Luckily, the 2017 Honda HR-V excels in all areas of fuel economy, whether you’re tackling city streets or open highways. Best of all, the 2017 Honda HR-V bests the 2017 Toyota RAV4 in highway fuel economy with 34 mpg** versus 30 mpg. But the 2017 HR-V doesn’t just reign supreme in its efficiency, but its many perks as well. 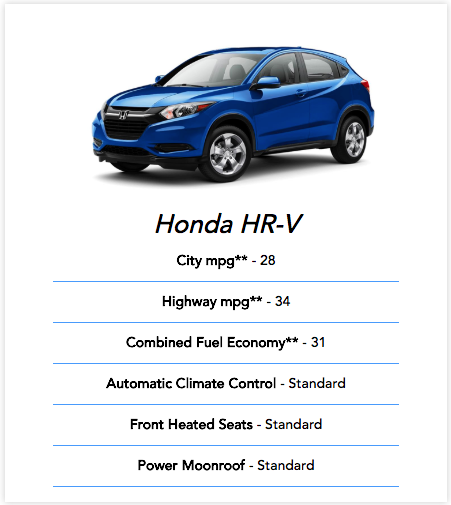 When you buy or lease a 2017 Honda HR-V, you can rest assured that features like automatic climate control, front heated seats and a power moonroof come standard. 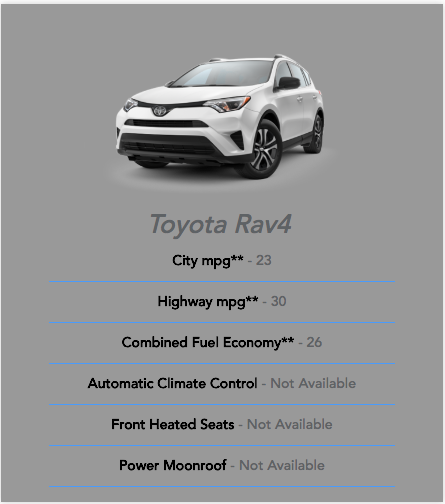 Comparatively, these features are not even available on the 2017 Toyota RAV4 LE FWD. Continue exploring the differences between the 2017 Honda HR-V and the 2017 Toyota RAV4. Odds are you will quickly discover that the 2017 HR-V is a superior compact SUV with better bang for your buck. Once you’ve weighed the options, schedule a test-drive at University Honda of Florence at your earliest convenience. Reading about the comparisons is one thing, but truly feeling these distinguishing factors behind the wheel of a 2017 Honda HR-V will make all the difference. We look forward to seeing you soon.